Back by unpopular demand is CA SB 798, although it never truly went away, just took a breather to recharge it's batteries and then get back in the fight. The anti-Airsoft legislation that Senator Kevin de Leon has brought upon us is back because he feels there are no other more pressing matters that he might be able to address with his resources and political influence, like say...I don't know...maybe...just off the topic of my head...the California budget crisis and how it has effected our public school system, placing thousands of teachers of out jobs, closing schools, increasing class sizes which in turn limits the amount of one-on-one time that a teacher is able to devote to each student to address individual needs, etc, etc, etc. That's a pretty lame issue of no importance, right, Senator? Who cares about education or kids? I suppose it makes sense though. Why would someone like Senator de Leon want to encourage resolving our education system when it's likely that once our children (aka "Tomorrow's Voters") or technically someone of any age gain a decent level of knowledge and understanding, it's likely they'd be able to see the wool he's trying to pull over our eyes. Note the "File Date" for the next SB 798 Hearing of August 15, 2011. That'd be Monday of next week, Slick. Sooo....Do you love Airsoft? Or do you love the idea of increased government regulation on your hobby? 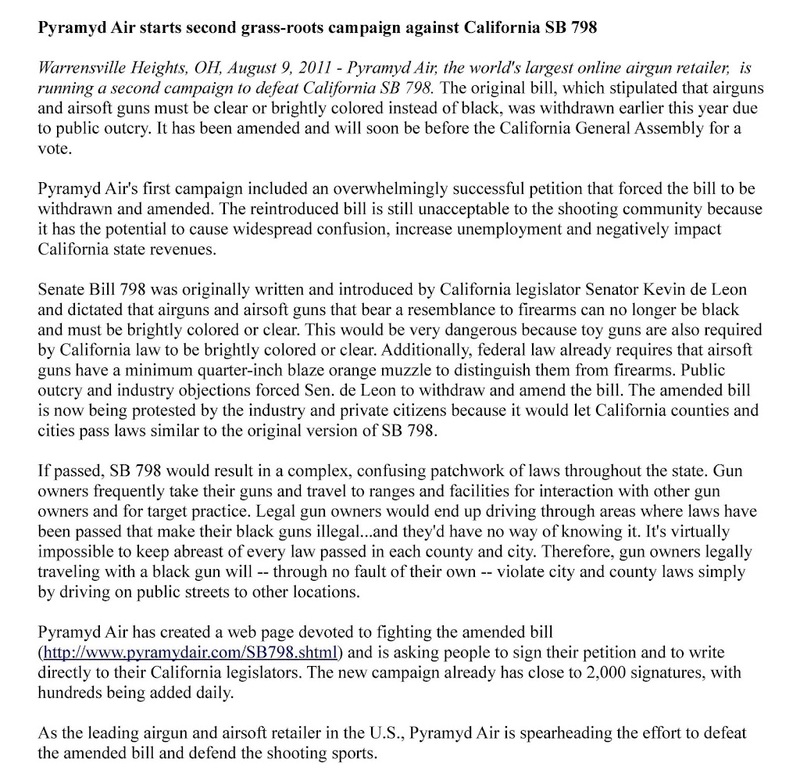 If the former is more your cup of tea, I suggest you make some calls to the California Assembly Members, particularly the ones likely to vote in favor of CA 798 (which would be against Airsoft). *I just wanted to say the word, "tyranny" for an ominous effect, regardless of whether it's appropriate to use in the context of this particular Pyramyd Airsoft blog entry. So what's it gonna be, boys and girls? Airsoft or not? It's time to rally up again. Sign the 2nd phase of the. Thanks for the reminder, Ted.